(0 Customer Reviews) | Write Review 8 issues per year Read articles on the best RV parks and resorts as well as key RV friendly attractions, events and sightseeing routes. Lifestyle articles as well as tech, gear and gadget reviews and special supplements make it a must read magazine to get the most from your RV experience. Explore the Beverly Hills of the Coachella Valley with us as we feature Palm Desert, California and then travel throughout the desert cities visiting RV friendly attractions and events. This issue also features top resorts, destinations and attractions from California to Florida. For those who love winter or can't get away, why not skate your way or cross-country ski through Ontario's MacGregor Point Provincial Park, or experience the best of BC's urban landscapes. Plus there are top tech, towing and editorial features to help you get the most of your RV experience. Read articles on the best RV parks and resorts as well as key RV friendly attractions, events and sightseeing routes. Lifestyle articles as well as tech, gear and gadget reviews and special supplements make it a must read magazine to get the most from your RV experience. 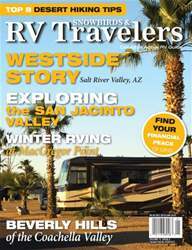 You'll receive 8 issues during a 1 year Snowbirds & RV Travelers magazine subscription. 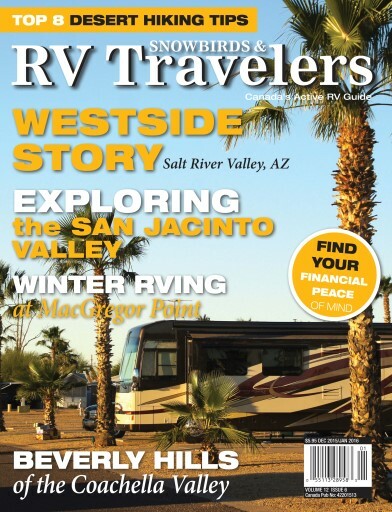 You'll receive 8 issues during a 1 year Snowbirds & RV Travelers magazine print subscription.